ON and off for the past 25 years or so I have been a Doctor Who fan. In the 80s and 90s there was a growing base of fans creating their own Doctor Who dramas. The cheapest way to do that was to produce radio play-like audiodramas. I have listened to some of the audiodramas created by the now professional troupe called BIG FINISH. They've banged out almost 90 different dramas in the Whovian realm, with many of them using the voices of the original TV show stars. They are pretty fun, though somewhat expensive on CD. Also there are groups like MAGIC BULLET which is now producing the Dr Who spinoff series of FACTION PARADOX. The neat thing is that the FANS themselves are also still out there making these. And now with digital sound creation and mixing technologies, and with the creators getting older and wiser, the fan audios are virtually on par, if not in some instances doing better productions than the pros. The word "fan" might lead you to believe that these would be clumsy pastiche attempts at remaking ideas from the original shows but with poor recording, bad writing and amature acting. But that is certainly not the case for at least a couple of these groups. The group that primarily comes to mind is DOCTOR WHO AUDIO DRAMA or DWAD for short. They have been creating Who based serials since the early 1980s, which is before some of my co-workers were born. They have gone through 4 Doctors, now on their 5th, and many companions, and along the way have built a healthy fan base for their work. Their scripts are clean and smart, the voice acting tends to be very professional and the technical side, the music and sounds effects are perfectly generated and put together to create dynamic, original and entertaining serials. Another group is DARKER PROJECTS who create audios based on multiple subjects ranging from Star Trek, to Lord Byron to the good Doctor as well. The neat thing about groups like this, DWAD and others is that when possible, they release their materials online for free. And FREE is a really good deal when it comes to getting a quality product, which these are. Go visit them. Download some shows and visit their forums. They are really open and nice folks. It looks like G-8 might've overstretched himself dogfighting with the Zombie Nazis as he and his Battle Aces have found themselves out of fuel and ammo on the wrong side of the enemy lines. It seems they might really be done for this time, but G-8 might have some very special friends just around the corner. Let's find out about L-11 and K-3! I don't have anything new to report, SO I'll just say "let's keep going with the story!" G-8 suddenly noticed something he hadn’t seen before. The Germans were tearing in from the south, cutting them off from their home lines. They couldn’t run for home now if they wanted to. He swung his flight in a climbing turn. He must get up to the level of the Germans before the fight started. And while he kicked over in that maneuver, his thumb came down on the trigger button to warm his guns. He jerked upright in alarm. Instantly the full horror of the situation flooded over him. They had been short of ammunition, he remembered the sergeant saying so. He had taken the faulty ammunition out their belts and had put in what there was of the good. They had used many rounds in trying to sever the wires that held the corpse to the Zeppelin. Now their belts were empty. His gasoline tank was nearly so. Nippy and Bull were most probably in the same fix. So you want to find out what happens next, don't you? If you are interested in further information on G-8 and his buddies, I suggest you checking out Chris Kalb's website. Chris also has created websites based on Doc Savage and The Spider. All of his websites are well executed and beautifully rendered, and a bonus on his G-8 site is a flash-generated computer game. And now on with the story. Looks like the guys are in the middle of a Voodoo pickle here. You better keep up so you know what's going on! 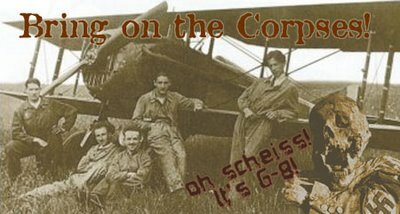 I'm just spewing this out since FLYBOYS is looming closer and closer and since we're listening to WWI master spy and SPAD fighter G-8 and his Battle Aces. I'm not doing any research here, just naming off the top of my head several movies I've seen and appreciated in this genre. First is Howard Hughes' THE HELLS ANGELS, which had hours of flying footage shot for it. Most of the edited out footage wound up as stock footage for other aviation movies. Great story of two brothers who are in France when the Germans start invading and enlist in the air corps. This movie did the kamikaze plane into the Zeppelin long before FLYBOYS. Next is DAWN PATROL with Errol Flynn. This is a great movie about the pressure of being the commander of a fighter squadron that has high casulties (as they all did back then). Wonderful Erol Flynn type heroics are transfered successfully into the skies. THE BLUE MAX with an interesting view from the German side. A more modern movie (relatively speaking, in 1966) with much more complicated characters who you are not sure you can or should root for. Not because of which side of the war they are on, but because the characters are so kniving, backstabbing and vainglorious. And then there are some serials such as ACE DRUMMOND and TAILSPIN TOMMY which even though not taking place during the Great War is around that time and uses nifty bi-planes. TAILSPIN TOMMY is more kid's adventures oriented (makes sense, since it's based on a newpaper comic strip) and ACE DRUMMOND is a more exotic affair, taking place in China. G-8 would have made a GREAT serial. Well let's see what he's up to. It seems the Scooby Doo effect that is usually the case in G-8 maybe actually turn out to be real Voodoo! We'll have to listen and find out! From now until Sept 21st, you can watch live video feed of a robot that is exploring the sunken dirigible USS Macon. The Macon carried five F9C Sparrowhawk biplanes which were launched and landed through a hang-down trapeze system. This floating aircraft carrier went down in a storm off of the California coast and was the last dirigible of the US Navy. Now what do you suppose would happen if that robot was poking around, and in that underwater debris they happened on zombies? Or in the case of a G-8 scenerio, underwater, Nazi zombies? Well I don't think it THAT far fetched. We've seen it happen before! "We, the dead pilots Munz, von Bach, von Klingen, Wolffson, beg to announce that we have been brought back from the dead by Croloi, the master of white and black magic. And by our resurrection, four of your best flyers are about to die, to take our places in the grave." FLYBOYEEEZ! Ok, so there's this movie coming out called "Flyboys". It looks kinda "Hollywood" and glitzy for my taste. It's supposed to be based on the true story of the Lafayette Escadrille, of which there is an earlier movie notably starring David Jassen and Clint Eastwood. To me a lot of the visual and dramatic queues seem to be straight out of Howard Hughes' THE HELL'S ANGELS (not the motocycle club) and THE BLUE MAX. I don't know if it will be any good or not, but since we're listening to a WWI story right now, I thought it would be appropriate to mention it here because FLYBOYS opens in theatres this week. Also since the Lafayette Escadrille was a French-based squadron it looks like they flew Nieuports and SPADS, just like G-8 and his buddies. In the FLYBOYS trailers I've only noticed the Nieuports. On to other business... A NOTE OF WARNING: I just want to take a second to inform the uninitiated that pulps in general and especially war-related pulps such as G-8 can and usually do contain a lot of very un-PC racial slurs. If you are offended by hearing racial slurs then you may not want to listen to, or read, the G-8 stories since they are filled with German epithets. Ever wonder what the Lafayette Escadrille would do if they encountered German Aces coming back as reanimated corpses? Well, me neither, but it is definately the realm of G-8 and his Aces, Nippy and Bull. No one seemed to know what to do in the little circle that was ever increasing as artillerymen came running up, only to stop and gasp. With an effort G-8 stepped forward, his gun held ready. He confronted the weird spectacle of unhumanity. When he spoke his voice came dry and rasping. “You are Oberteutnant von Griel ?” he asked. Then cold sweat burst out on his body, lor the eyes didn’t even look at him, although he felt that the man could see him. The lips didn’t move. Nothing about that stiff, standing figure except its head. And that nodded once, in a jerky motion. Down, forward and back. The forward movement was a snapping drop almost to the chest, as though the strength in the neck had suddenly given out. Then a backward motion, as though the owner were lifting his head by a slow, weary effort. Time for a new full length book! 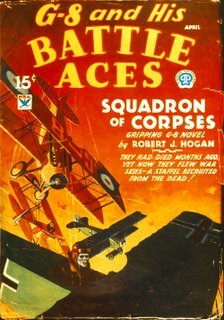 G-8 was an heroic aviator and spy during World War I in pulp fiction. He started in his own title G-8 and His Battle Aces, published by Popular Publications. All stories were written by Robert J Hogan, under his own name. The title lasted 110 issues, from October, 1933 to June, 1944. Several of the novels have been reprinted by several publishers. There have also been a couple of comic books published with him. 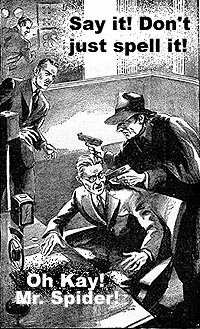 While not as dramatic a character as Doc Savage or the Shadow, his stories were often outlandish, with many supernatural or science fiction elements. G-8's true identity was never revealed. His man servant was named Battle. His wing-men were Nippy Weston and Bull Martin. His adventures entailed fighting against the lethal super technology that was constantly created by the Kaiser's mad scientists. Our story for this session is SQUADRON OF CORPSES. "They had been buried months ago -- yet now they flew war skies, corpses that could not be killed! And for every resurrected Boche, a Yank died-- mysteriously, terribly. Who were these ghastly aces? How could G-8 and his buddies hope to fight a staffel recruited from the dead!" We'll be doing two chapters at a time since the chapters are so short (about 10 -15 minutes a piece). I have gotten to the point to where I can comfortably listen to TTS audio and get enjoyment from hearing a story in this manner. But I do understand that it is not for all people. Thus I found this to be a great headline for today's story, THE WHISPERER IN DARKNESS by H. P. Lovecraft. This is one of my favorite Lovecraft tales. It has all of the hooks that you expect in his storytelling; Isolation, remoteness, fear of the unknown, hidden alien forces whose history is intertwined with Earth's own history going back to prehistoric times, paranoia, the pantheon of Cthulhu, a library of blasphemous books and the quick, down and dirty shock ending. The horror is clearly born from science fiction and not the occult, which to me is where most of Lovecraft's writing is at its greatest power. 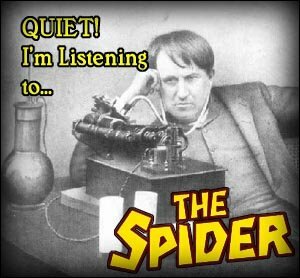 THE SPIDER - THE CHOLERA KING - FINAL CHAPTER! So without further ado, here is the final chapter of The SPIDER - THE CHOLERA KING. Also, if you would like to download the entire audiobook at once, click here for a zip of all the mp3s. Special thanks to Pocketfiction.com for the etext of this classic pulp! Next up... H. P. Lovecraft's The WHISPERER IN DARKNESS! What I like about the Pulps. I guess I have a short attention span, or maybe it's because I read slowly. But I tend to prefer short stories to novel-length books. That was, I did until I started reading the pulps. What makes them different? I supposed it has to do with the fat to lean meat content. I like a story that keeps a good quick pace and doesn't get bogged down in too much character self-reflection or tangential, non-necessary literary masturbation. Character devlopement is essential, but keep it to the stories' focus and don't try to flesh out the characters so much with non-relative back story that it becomes hopelessly boring. Eh... maybe that means I'm low-brow. But I know what I like, and it isn't reading literary lard. Even some of the pulps suffer from it. Like with The Shadow, there can wind up being so much emphasis on atmosphere or unnecessary plot tangents as to bog down the storyline itself. I think maybe when my time was more free to read leisurly this wasn't such an issue and I could take in the value of all the extrainious description and random lines of thought. But nowadays I work 55-60 hours a week as a standard, and even more when it's crunch time. So I've gotten to where the stories I read need to cut to the chase or I wind up getting frustrated. So I've lurked in the domain of short stories for the past 14 years or so. Now that I'm reading pulps for the past year, I've come to the realization I just typed out above. That it isn't really the length, it's the strength of the narrative throughput. The signal to noise ratio. Why am I telling you this? I suppose because I just realized this in the past week. The SPIDER has no time for tangents or plot branches, he's too busy ventilating bad guys. If you happen to have shockwave and flash, then below you will see this box with an arrow in it. Press the arrow to watch the HPLHS trailer for The Call of Cthulhu, which I talked about two posts back. I promise you it is quite nice! And now back to our regularly scheduled program: Creating chapters for an audiobook using dspeech. Dspeech is a homegrown TTS engine that has a variety of interesting applications and abilities, including speech recognition. So you could concievably have a conversation with this program if you have enough context sensitive responses plugged in. But I have no need for that. The nifty thing in this program is being able to create chaptered audio files. Huh? Well, that means that it will take one big block of text and depending on how you want to break it up, it will encode the wav or mp3 into several files. You can have a preset time of 5, 10, 20 and 30 minute segments or have a custom TAG that will create the segments based on exactly where you want. This tells dspeech to start a new audio file at #BREAK. When you save, it will generate a new directory and put all of the new files in it with each numbered appropriately. Also the TTS will say the name of the file at the beginning of each audio. So that is how you automatically make your chaptered audios. He ordered the fire truck on which he rode sent swiftly forward. His mind was made up. He would leave Mallory, "Colonel" Mallory, in charge and go back to New York City. Somewhere there, the Master of the Plague still ruled, and the Spider's task would not be done until he affixed his small crimson seal to the butcher's forehead! The Spider's lips were smiling as he shot forward. Tomorrow, he would be able to join in a decisive battle against the Plague Master! So let's see what happens next in THE CHOLERA KING, Chapter NINE; Death for the Spider! I read quite a bit. In fact I have at any given time at least 3 books on my nightstand that I alternate between. 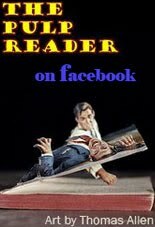 Usually a fiction book (right now the Carroll and Graf THE SPIDER book 4), maybe a comic (right now, CRIME CLASSICS) and a non-fiction book (right now Don Hutchinson's THE GREAT PULP HEROES). But that doesn't mean that I don't need some help in getting through the massive backlog of stuff to read. So many books, so little time. 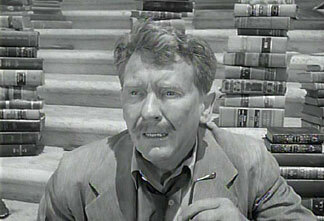 We don't want to wind up like poor Henry Bemis and be all frustrated with all the reading you just can't catch up on. So that's why this blog is here. To help you, who might be in a similar situation, get through your backlog with some alternate means. For me that's making these audiobooks and listening to them in the car. If you cruise back to the first several posts you'll see what my process has been for creating these audios. There was no other way. He moved his shoulders heavily, constantly aware of the thousands who, gazed upon him, who looked to him for leadership and for life. He flung an arm to the sky, turned, thrust his whole pointing body northward. "Forward!" he shouted, and all along the street, to east and to west and to southward as far as the eye could see and the ear could hear, the cry was picked up and repeated. "Forward! " A city was marching out to death, or perhaps to life. We're more than halfway through THE CHOLERA KING and I'm already working on what the next experiment will be. I'm thinking of encoding a single short story before we start the next book. Since Fall is coming and it's getting close to Halloween season, and since the H. P. Lovecraft Historical Societie's next film is going to be THE WHISPERER IN DARKNESS I thought that might be a good short for the Fall season kickoff. 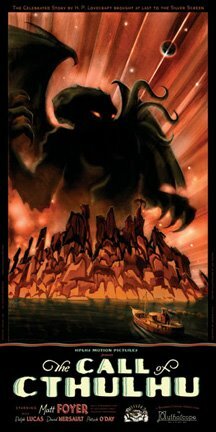 If you do not know about the HPLHS movie productions and you are into Lovecraft, I would fully and heartily suggest heading over to their website and buying the DVD of their first major movie release, THE CALL OF CTHULHU. This silent, black and white, indie film is in my opinion the best Lovecraft adaptation that has been done. Ever. Period. The window sill slammed the back of his knees and with a wild cry, he pitched backward into space. Wentworth half-sprang to the sill to catch him, then stopped, turning away with a twisted smile. Justice had been done. The man he had shot had ceased to scream. His breath whistled hoarsely in his throat and, even as the Spider's cold gaze returned to him, he shivered convulsively, once, twice, and was dead. Twice more the Spider's seal was imprinted and he paused a moment, downstairs, beside the pitiful remains of what had been a young girl. His face was wrenched awry. God give him the privilege of finding many more of these beasts tonight! And now we continue THE CHOLERA KING, Chapter SEVEN; "Save Me, Spider!" So pretty much the only place I listen to these audios is in my car. I have a nice 20 mile drive in the countryside between home and work. OK, sometimes it's not so nice because it can take from 25 to 75 minutes to get from point A to B, depending on the traffic. It definately makes it nice to be listening to something you really like when your stuck in stop n go traffic for stupid amounts of time. Everyone has their own method for doing things, right? Well yeah, duh. Well I'm going to tell you my method of listening to mp3's in the car. I don't have a CD player in the car. Much less one that plays mp3s. And if I did, I wouldn't want to burn through an endless run of discs to listen to ever changing mp3s (unless you have good CDRWs, in which case, maybe that's not an issue, but it is with me because, like I said, there's no CD player in the car). So I researched FM Transmitters, which are devices with a mini-jack audio-in, a mini FM transmitter and powered through the cigarette lighter plug. You plug that into your car and plug your MP3 player into the transmitter, tune it to a station that isn't being used locally and tada, you are sending a FM radio transmission to yourself. The one I bought is here. I got it at Radio Shack. In fact I bought another one for my wife's car. We're very happy with them. I haven't used it much in a big city like San Francisco and when I have the sound has tended to be a little defused with static at times, but especially near really big metal structures like the Golden Gate Bridge. But out in the coutryside with the cows and chickens it works absolutely wonderfully. CLICK HERE FOR EPISODE SIX; The Man in Scarlet! I can't pronounce that?!? So I'll just spell it out... AYE ESS the story continues... So says the TTS engine. For some reason there are certain times during the TTS reading where the engine does not actually say a word but will spell it out. It seems to usually happen with words that are in ALL CAPS. But there are full sentences of text that are in ALL CAPS for whatever reason in the stories (like simulating a telegram or news headline) and it has no problem with those. But every once in a while it chokes on small, simple, single word ALL CAPS instances. It's something I've come to live with, even though it is fairly jarring anytime it happens. I will keep looking into and experimenting with what the problem might be. But that won't keep us from the next Chapter of THE CHOLERA KING! CLICK HERE TO LISTEN TO CHAPTER FIVE: Disaster! Today me and the wife have been cleaning out our office and man has it been a chore. Not that it has anything to do with pulps or audio, but there ya go. The office sure looks great though and I found some forgotten pulps buried under the debris, such as the Berkeley Medallion edition of G-8 AND HIS BATTLE ACES: The Bat Staffle. So all the paperwork shoveling and box and bookshelf moving was back-breaking work and it's why I'm too tired to type muchtonight. BUT, I do want to keep these audios flowing everyday when it is possible. So with no further pontification, bow down to THE CHOLERA KING! Getting used to computer generated voices. When I first started listening to these TTS (text to speech) audios it was very jarring on the ear. Even though there are some pretty decent approximations of natural voice intonations, it can still wind up seeming fairly monotonous. After a while I got used to it though and usually within a couple of seconds it assimilates into my consciousness as a natural and normal sounding voice. I suppose I get into a certain frame of mind when listening. To me it is more like I'm "reading with my ears" rather than listening to someone tell a story. In a traditional audio book the narrator is likely to use different voices and inflections to get a certain character, scene or idea across. With TTS it is not quite so advanced yet. * There can be a certain monotony to it. BUT, if you listen like I do: I'm still using the parts of my brain of which when I read, I imagine the sound of a character's voice, invision the scenery and all the rest. I think listening like that is a different frame of mind than listening to a human storyteller. It works for me. I'm wondering if it can work for others? * It is getting there though. For example there are several TTS engines that can read a script, having different voices assigned to each character based on custom TAGS that let the engine know when to use that particular voice type. OK! On with THE CHOLERA KING, Chapter THREE, Plague City!